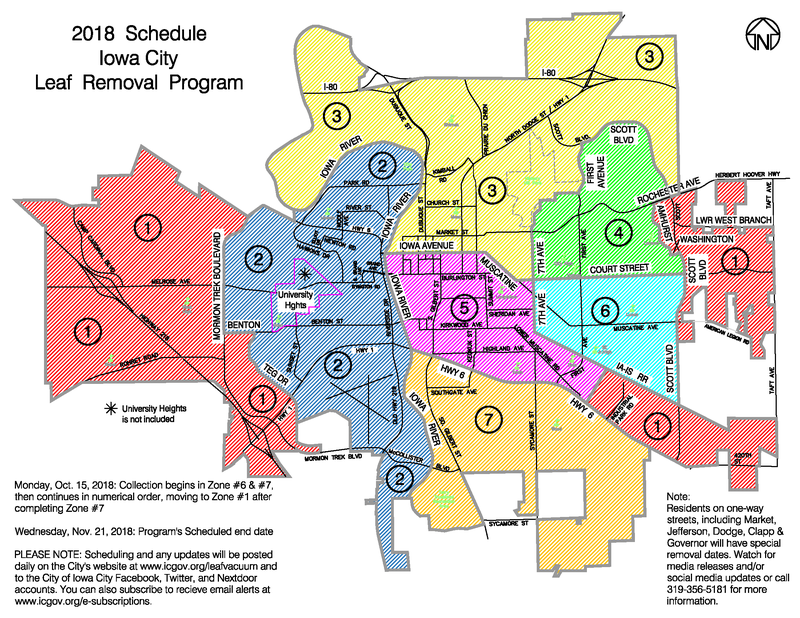 The Iowa City Leaf Vacuum Program has ended for the 2018 season. The City of Iowa City offers leaf vacuuming. Weekly schedules are posted under the news feed at the tops of this page. Despite all advanced preparation; equipment breakdowns, heavy rain, and snow can slow or end the program early. Do not wait to rake. An early winter requires equipment and crews to be moved to snow removal. Consider other leaf removal options if you are worried about timing or if the program ends early. Watch a brief video to learn how to prepare your leaves for the leaf vacuum. Leaf vacuuming begins Monday, Oct. 15, 2018, in zones 6 and 7, and will proceed in numerical order, moving to Zone 1 after 7 is complete. The process will repeat until the program ends. To see schedules indicating where crews will work over a five-day period, visit www.icgov.org/leafvacuum, follow the City of Iowa City on Facebook, Twitter and Nextdoor, or subscribe for e-mail updates at www.icgov.org/e-subscriptions. The schedule will be updated and posted daily. If you do not have direct access to the internet, call 319-356-5181. Rake leaves into a pile on the City right-of-way in front of your house, between the sidewalk and curb. No sticks, brush, garden refuse or other waste – only leaves. Piles should be no further than 5 ft. back from the curb, as the vacuum hose will not reach farther. Combine your leaves into sizeable piles. It slows crews to have to work with many small piles. The minimum size for one pile should be the equivalent of one paper yard waste bag. Do not rake leaves into the street, as they may be washed into the storm sewer and can cause flooding. Do not pile leaves around mailboxes and signposts, instead place the pile in an open area. Cars parked on the street slow down leaf pick up. In areas where on-street parking is heavy, ‘No Parking’ signs will be posted while leaf crews are in the area. If you live on a street with heavy parking and you wish to have signs placed, call the Streets Division at 319-356-5181 for consideration. On streets where calendar parking is enforced, leaf vacuuming will occur on the side without parking. Be considerate when parking on the street and avoid parking near leaf piles on pick up days. Bag leaves in paper yard waste bags or place in your yard waste container for faster and guaranteed pick up. Bags will be collected on your regular curbside service day through January. Call for an appointment during annual service suspension. More at www.icgov.org/organics. Unlimited bags can be placed at the curb. Note, this service is not free for commercial customers.